It has been our busiest month yet. I have kiddos playing volleyball, indoor soccer and basketball right now so it feels like we have something EVERY SINGLE EVENING. Don’t get me wrong, I LOVE IT, but we have been having LOTS of quick meals. Between the crock pot, my new Instant Pot, my freezer meal stash and quick skillet meals, we have been able to avoid the drive-thru so far and that makes me (and my wallet!) very happy! This Korean Beef Bowl has been on my list to try for a while now and I finally got around to making it a couple of weeks ago. 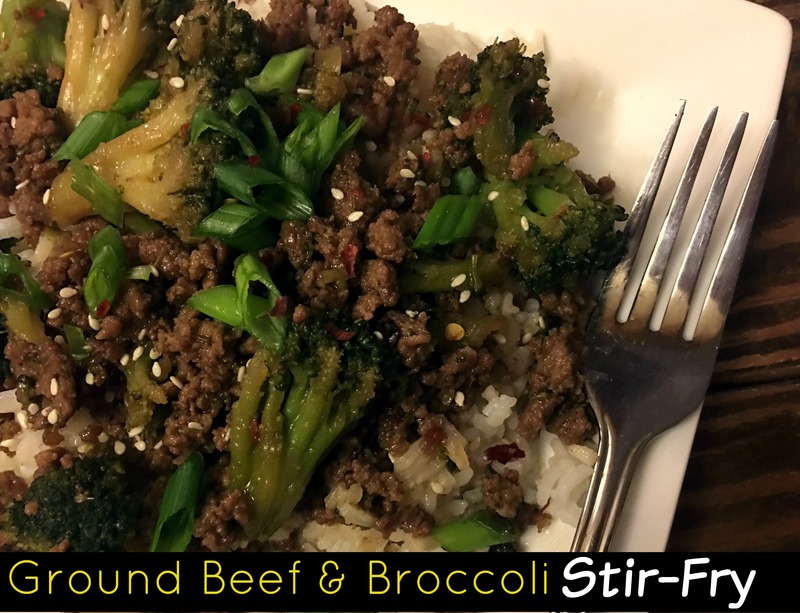 I added a ton of broccoli to the recipe to give us some veggies and doubled the sauce and OH MY GOODNESS do we love it! Y’all this totally exceeded expectations. I have made it twice since and it may possibly be our new favorite weeknight meal. Not only is it ABSOLUTELY delicious, but it is ready in about 20 minutes. You just can’t beat that. In a bowl, combine brown sugar, soy sauce, sesame oil. red pepper flakes, ground ginger, minced garlic and cornstarch. Set aside. In a large skillet, add ground beef and cook until halfway done. Next, add the broccoli to the same skillet. Continue cooking until beef is done and broccoli is cooked to your liking. Add sauce to the pan and cook over medium heat for a couple minutes, stirring occasionally. Serve over white rice, sprinkled with green onions and sesame seeds. This looks super yummy. I love that you used ground beef! This is perfect for weeknights!! WE LOVE anything Asian — so trying this! I’m always a little scared trying recipes from online, but this was actually really good. I love that it was super simple and took no time at all to make. Tastes just like Yoshinoya’s ‘angus steak’. Definitely making again! Loved how easy this was! I subbed the brown sugar for 1/4 cup of honey, omitted the cornstarch, and used a Tbs of fresh ginger. It was delicious! I tried this once, by the recipe and it was really good. Now I am enhancing it with carrots and celery to dehydrate it for backpacking. I am always looking for good backpacking meals! I love this recipe, it’s my partners favorite meal. Been using fresh ginger and garlic and simmering that in the pan with sesame oil first before I cook the beef. That way I maximize the ginger/garlic flavors and the garlic gets properly cooked. Also been adding onions, carrots and celery to it. Carrots are a nice addition.